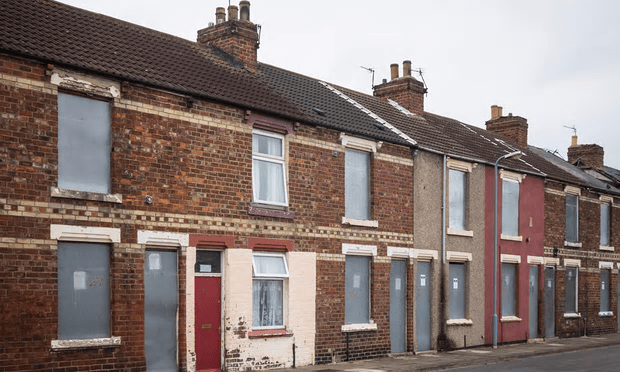 Boarded-up housing in Middlesbrough: ‘Leave voters were concentrated in former industrial areas hit hardest by low pay, job insecurity and economic stagnation’ [Image: Alamy]. Members of This Writer’s local Labour branch have been asking for guidance on Labour’s response to the UK’s decision to leave the European Union. Here it is – at least in part – according to Jeremy Corbyn. Notice that, while Mr Corbyn says Labour will respect the decision of the British people, he does not mention invoking Article 50 and going through the process of leaving the EU. All he says is that we must negotiate a new relationship with that organisation. It seems to me that he has been considering possible options for the UK, and ways of getting the best out of a continuing relationship with the EU – a relationship we must have, since it is the most powerful trading bloc in the World – while also ridding ourselves of restrictions that may have hindered the UK’s economy. Labour has the initiative on this issue. While the Tories are focusing on their little leadership election, involving less than a quarter of one per cent of the population, Mr Corbyn is focusing on issues that will involve us all. During the referendum campaign, we argued for an end to EU-enforced liberalisation and privatisation of public services – and for freedom for public enterprise and public investment, now restricted by EU treaties. Those freedoms need to be part of the coming negotiations. Labour also campaigned for tougher regulation of the jobs market and of the exploitation of migrant labour to undercut pay and conditions, as the best way to protect jobs and living standards in the EU. I am meeting fellow European socialist leaders in Paris this week to discuss the refugee crisis and Europe’s future after Britain’s vote to leave. The increasing momentum to reform the EU will strengthen the Labour case. Corbyn’s views are utterly irrelevant, as he will never have any influence over the direction of the UK. I’d be more interested in what Theresa May and Andrea Leadsom were saying on the matter. Ye-es… Are you sure you’re a member of Labour, Phil?